Canada’s most southern lavender farm offers you a scentsational experience! Come encounter an awakening of your senses with lavender flavors, colors, aromas, the sound of birds singing softly and the gentle feel of lake breezes caressing your skin. 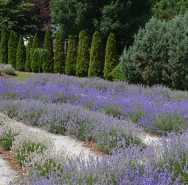 Relax and enjoy a peaceful time in our gardens with over 48 lavender varieties while sipping on an award winning glass of wine from our sister company North 42 Degrees Estate Winery and visit our gift shop where you’ll find something to suit all your lavender needs, from aromatherapy products to culinary delights.